In just a few weeks, the Ocean’s franchise will give us one of the most exciting ensembles of the year in an all-female take on Steven Soderbergh’s classic heist trilogy. Instead of a George Clooney-led casino robbery, Gary Ross’ Ocean’s 8 follows Sandra Bullock‘s Debbie Ocean and a crew of women who sneak inside the Met Gala to steal some jewels. Fresh out of jail, Bullock’s Debbie, the sister to Clooney’s Danny Ocean, rounds up a team of skilled crooks to rob a $150 million dollar Cartier necklace from the most exclusive party in the world. 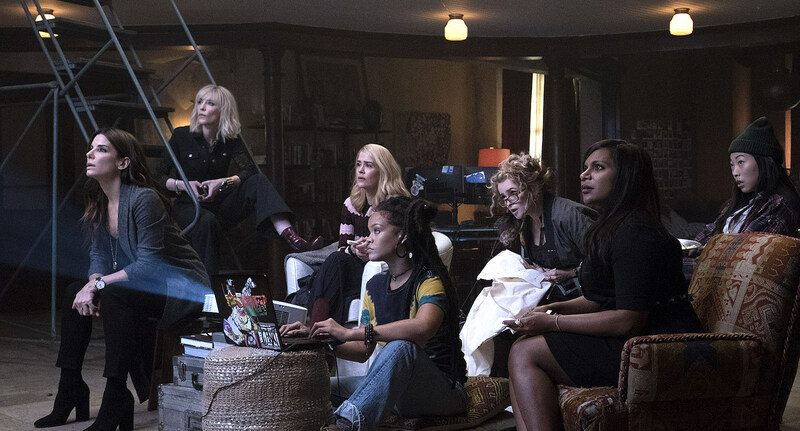 She recruits former partner Lou, played by Cate Blanchett, Sarah Paulson’s suburban mom Tammy, Rihanna’s hacker Nine Ball, Helena Bonham Carter’s Irish fashion designer Rose, Awkwafina’s thief Constance and Mindy Kaling’s jewel expert Amita. The crew targets Anne Hathaway’s snooty celeb Daphne Kluger as the centerpiece of the heist. On Tuesday morning, the cast (minus Carter and Rihanna), along with writer-director Ross (The Hunger Games) and co-writer Olivia Milch, shared new details about the film and their experiences. During the film’s press conference, set appropriately inside Met Museum in the Temple of Dendur, they spoke about how the movie connects to the original trilogy, the cameos, how Ross came up with the idea for an all-female Ocean’s, and what it was like to be in a cast dominated by women. The Ocean’s 8 gang also shared an anecdote about Carter that you have to read to believe. 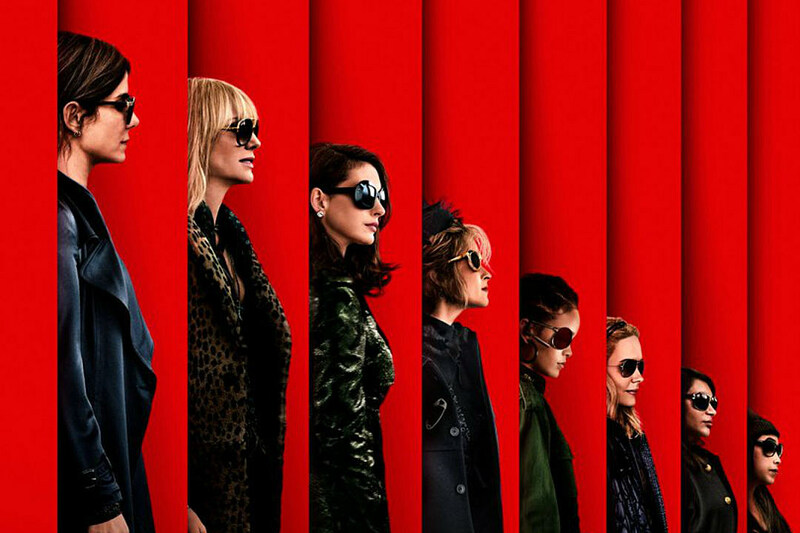 Read on for six things to know about the new film, spoiler-free, and stay tuned for our full review of Ocean’s 8 in a couple weeks. But Gravity is what inspired the director to center the movie around Danny Ocean’s criminal sister. Ross noted that during the press tour for Gravity, Bullock and Clooney likened their professional relationship to that of siblings. “It was right around the time of Gravity and you and George were talking about the brother-sister relationship you guys had in the press. I took that seriously, maybe she could be his sister.” And thus, Debbie Ocean was brought to life. There were many cameos, as you know, that didn’t make the movie, but I think that’s just a reflection of your job, if you’re doing it right, is to just listen to the movie at each step and to hear what the movie wants. What we started to learn that the movie wanted, was it was about these women much more than it was about the antecedent or the previous male versions. It was about them and their autonomy. There are references to the previous stuff, but we tried to keep those references to a minimum and let the script thrive. When the cast was asked about their experiences working together, Bullock described how unique it was to work on a film with so many female leads. She likened her usual experience of being one of the few actresses on a set to being on an island. “By the end [of this film], and long past this film is out, we managed to connect on a level that we never ever would have been given the chance [to],” she said. One thing I remember is not having to put a filter on. What you said about feeling like an island on a set – I was used to that. I’ve been really lucky, I’ve worked with a lot of great women, but there’s usually just one or two of us. The idea that we could all bring all the experiences we’ve ever had and put it into a shared pool and collectively become better because we were able to share it. That was one of the first things that I remember, is feeling safe, and feeling like I was with people I felt so proud to be amongst. […] I’ve never been given an opportunity like this, and I’ve been doing this for a minute. It’s a wonderful space to occupy. I’m really excited for the moment when this doesn’t feel special anymore. There was a cast party where Carter, allegedly, turned her chest into a charcuterie platter. The details are scarce, unfortunately, but Awkwafina, Paulson, Bullock, Kaling, Hathaway and Blanchett laughed about a “pu pu platter” of meat strewn across Carter’s chest, likening her to a party hostess passing out a tray of drinks. Paulson claims to have a photo of the Helena Bonham Carter meat incident, and I plan to launch a full investigation into the matter to get the full story. One of the things we’re saying in that 8-year-old girl moment is – and not that there’s anything wrong with it – but you don’t have to grow up to be a princess. There are other archetypes. Hathaway quickly interrupted to remind everyone that her Princess of Geneva is the one exception.